I’ve wanted to learn to ski for years now, having always been a fan of the world cup ski events that were once broadcast on the welsh TV channel S4C in the early hours of Sunday mornings. 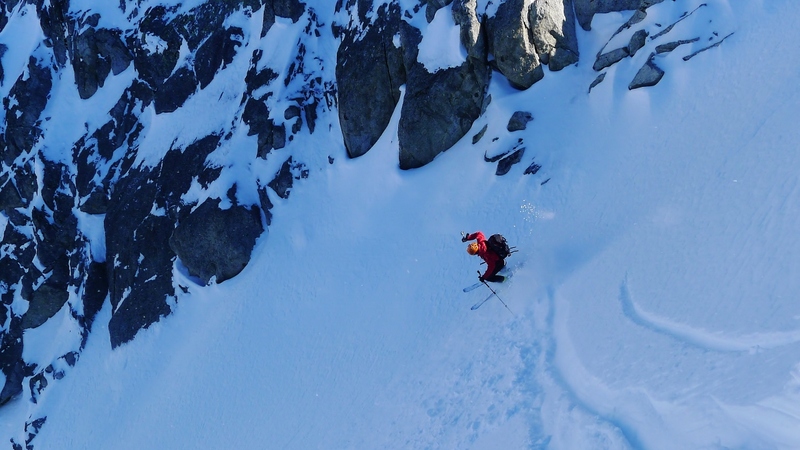 I guess I’d never really had the opportunity of a ski trip when I was younger and in the last few years I’ve been so keen to go climbing that I’ve never put money aside for a ski trip. This winter, however, I finally committed to spending a month in the Alps with sights firmly set on skiing and alpine climbing. 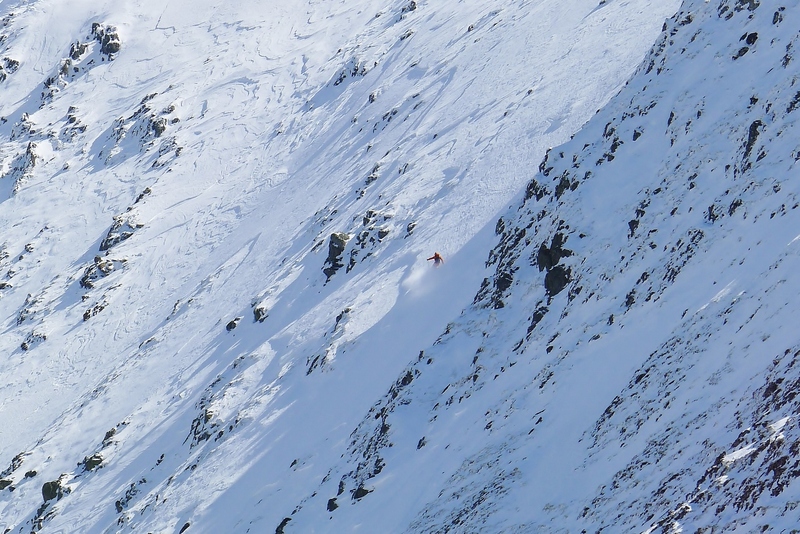 Alpine ambitions fell at the wayside, along with sustained periods of good weather, whilst skiing opportunities grew and grew as the snow moved in and the ‘pow’ arrived. It’s been a long while since I learnt a new sport and I’d forgotten the enjoyment, frustration and satisfaction that comes with it. My first few days (well the whole month really) were mainly spent on my backside, cursing the schools of little ski ninjas who seemed to be able to come out of nowhere and trip you over. 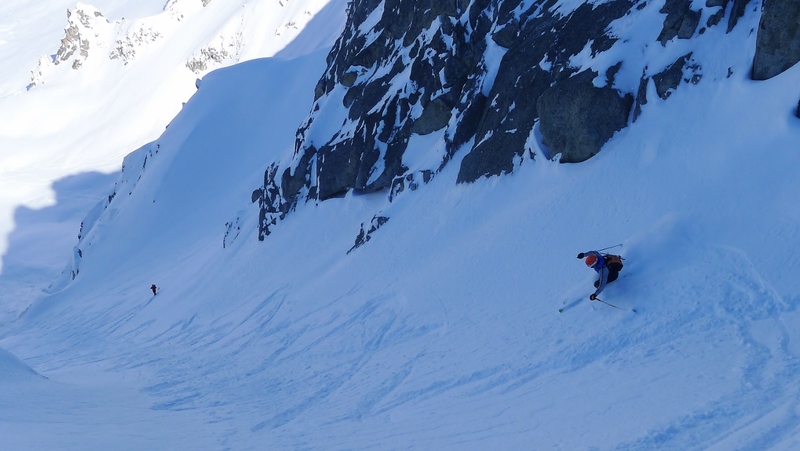 Soon enough I developed a dodgy, kamikaze ski style (straight lines) and I felt confident enough on my second day to attempt to ski down the Argentiere glacier. 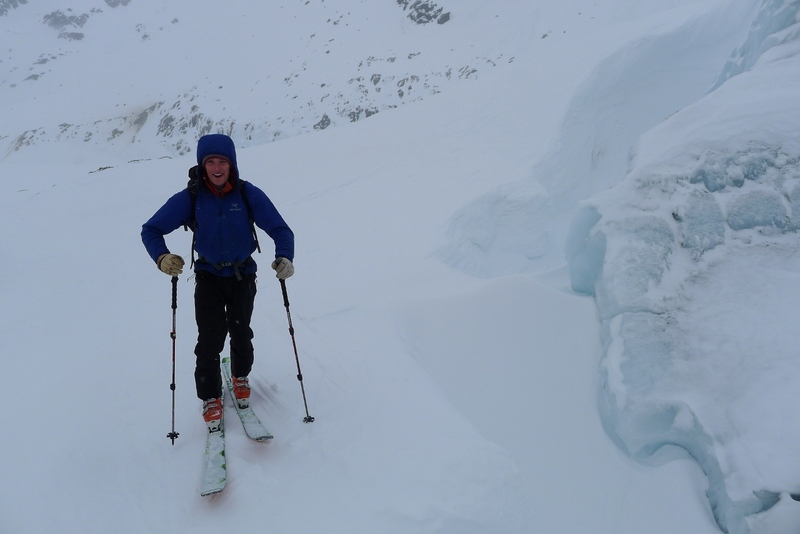 So I departed early from Argentiere with Ben Alsford and skinned up to and along the glacier before beginning my descent, much to his amusement and the horror of other skiers who undoubtedly expected me to plummet into a crevasse! Feeling embarrassed and dejected I tried to keep a low profile only for Leanne Callaghan to find me and talk me into taking part in a ski mountaineering race. Obviously I’ve got ‘gullible’ written all over my forehead and I naively agreed that it would be a fun event to take part in. The race was two weeks away; plenty of time, I thought, to convert running fitness into skiing prowess. 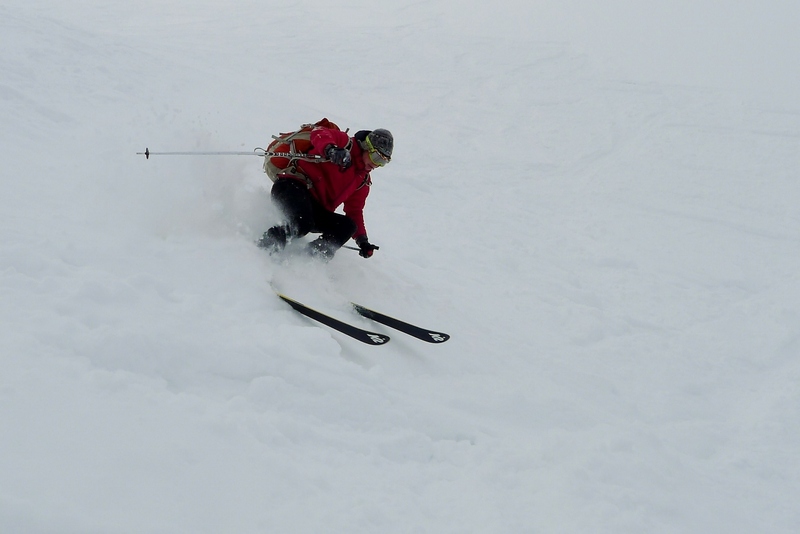 It wasn’t just riding two planks of wood that I had to learn though; skiing seems to have its own vocabulary. I felt a little like Johnny Utah in Point Break trying to fit in with the cool kids, erm, bra. From pow pow and freshies to steeps and gnar: I’m not really sure where I stand with all this, climbers obviously aren’t cool at all! Team RAF: Andy, Dyl and Joey joined me out in Les Houches and Andy kindly made me feel better about my skiing by falling over just as much. 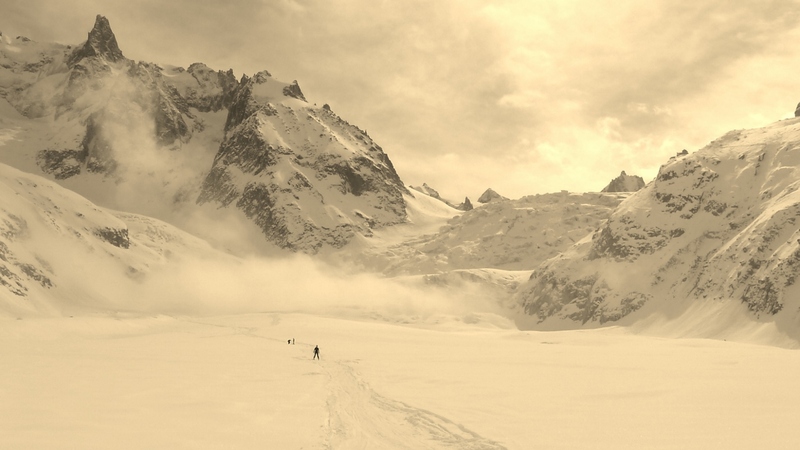 We had some good days out touring with descents of the awesome Vallee Blanche as well as over the Aiguille Rouge and different cols above the Argentiere glacier. After team RAF left I joined team skimo (ski mountaineers, if you, like me, have no idea what abbreviations stand for).Team skimo comprised of Jon, Ben, Ben and Misha- a rather fit bunch of ski Jedi’s. 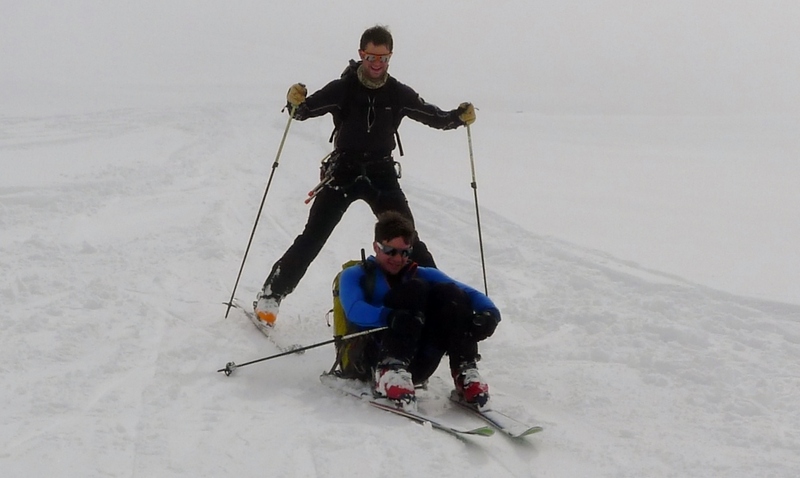 I tagged along with their plan for a tour up a Swiss peak called Le Genepi. The sun was baking hot as we slogged up towards the summit and when we got there I realised that a 45° slope is steeper than a green run on the piste. Quaking in my bright orange boots I decided to get some photo’s of the other guys descending first and with terror in my eyes followed them down with little grace or style. On the descent I managed to snap an already dud ski in some deep powder and got a very tired left leg as I balanced my way down to the car! The race day soon caught up with us and having been prepped by Jon I felt ready to give the race a crack. The start of the race was quite exciting as a flock of skis and poles got thrown around and having made a bit of a sprint to get into a reasonable position I promptly fell over on a suspiciously flat stretch of snow and got overtaken by everybody again. If I’m honest I found the race slightly frustrating- it’s similar to a triathlon but more things can go wrong! My kick-turns were pretty sloppy and my uphill technique went to pot whenever the slope went beyond a certain angle. Having borrowed Jon’s tiny race skis I found the descents desperate and when I finished the race I looked a little bit like the abominable snowman having stacked it on multiple occasions! Jon won the men’s race to become the British champion and Gabby took the honours in the women’s race. I returned from the Alps a few days ago to a very wintery North Wales. 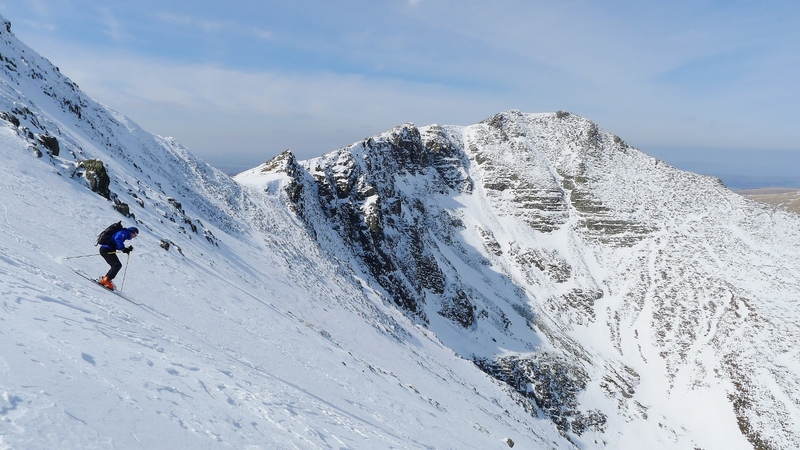 I had an awesome ski in the Carneddau mountains but have since knocked a big chunk of ice into my face whilst ice climbing- my verdict is that skiing is more enjoyable than winter climbing!